Do you desire more knowledge about your aura? About acquiring more abundance? About experiencing greater depths of compassion and brotherhood? These four unique, life-altering topics will stir your heart and challenge you to go deeper and higher in your quest for self-mastery. Wayne Purdin, children’s author and literary authority on Baum, will take you into a world of profound insight, spiritual symbolism, and fantasy. Enter his FREE webinar playshop for 6 hours of dance, song, yoga, meditation and inner-child dialog and discover The Wonderful Wisdom of Oz! Engage your heart, your mind and your body in the deeper mysteries of Baum’s spiritual symbols and see how far you’ve come on your journey along the path of the ascension. Join David as he gives live, unrehearsed discourses inspired by the Elohim, and then engage in lively question and answer discussion, dialogue and debate! This will be an exhilarating spiritual experience with the mighty Elohim, who will provide keys for world transmutation as we work as divine scientists to transform ourselves from within. 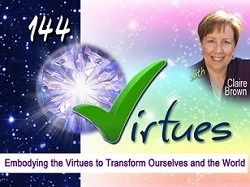 The 144 Virtues: Embodying the Virtues to Transform Ourselves and the World. What are the 144 virtues? What do the ascended masters say about the virtues and their importance to us? 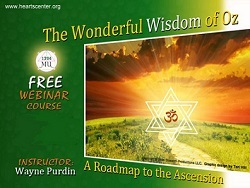 This course will assist you in identifying and exploring the 144 virtues and how they relate to the twelve God-qualities on the cosmic clock,* and to the seven chakras. There will be opportunity via our Forum for you to discuss what the virtues mean to you personally—the ways you experience them, understand them, envision them, and live them. You will learn how embodying them will accelerate you on your path as an initiate. 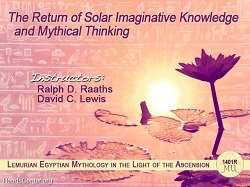 This course is a free introduction to course 1401 The Return of Solar Imaginative Knowledge and Mythical Thinking - Lemurian Egyptian Mythology in the Light of the Ascension. In this introductory class we learn that during the golden age on Lemuria, when solar knowledge was understood by mankind and gods and ascended hierarchy still walked and talked with us, humanity had a unique consciousness. Our knowledge was received in imaginations; thought forms existed as a panorama of mythological archetypes that incorporated cosmic knowledge. This highly imaginative mythical thinking, when studied in the right way, can once again open the door to cosmic knowledge without losing the newly awakened scientific intellect that has dawned on mankind since the Renaissance. Enjoy this free introduction, then discover in a subsequent course (1401) more about a new solar imaginative form of cognition that is now awakening.